Hail, Precious Blood, flowing from the wounds of our crucified Lord Jesus Christ, and washing away the sins of the whole world. The devotional theme of the Friday evening Traditional Latin Masses at St. Titus Church is the Most Precious Blood of Our Lord Jesus Christ (feast day 1 July). 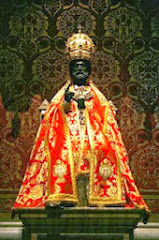 Blessed Pius IX instituted this feast in thanksgiving for the deliverance of the Apostolic See from the violent revolutionaries who had expelled the pope to Gaeta. In 1849, with the assistance of the French army, they were vanquished and the pope was able to return to Rome. The meaning of this devotion is closely akin to that of the Sacred Heart. The Precious Blood is the price of universal redemption, which love would not have to be anything less than itself. There is very close connection between the Heart and the Blood not only because, according to St. John, after the death of Jesus, blood and water flowed from His wounded Heart, but because the first chalice in which that divine Blood was consecrated and vivified was precisely the Heart of the incarnate Word. 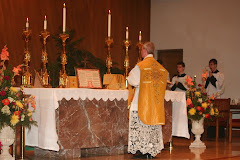 The Mass is of quite recent composition. 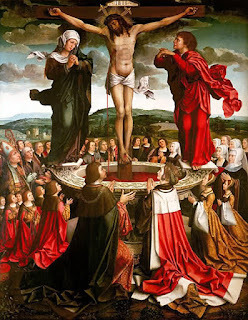 In the ancient Roman rite the Mass of Passion Sunday was especially intended to recall to the remembrance of the faithful the infinite value of the Blood of Jesus Christ. THOU hast redeemed us, O Lord, in Thy blood, out of every tribe and tongue, and people, and nation, and hast made us to God a kingdom. Ps. 88, 2. The mercies of the Lord I will sing forever: I will show forth Thy truth with my mouth to generation and generation. V. Glory. ALMIGHTY, eternal God, Who hast appointed Thine only-begotten Son to be the Redeemer of the world, and hast willed to be appeased by His blood, grant us, we beseech Thee, so incessantly to worship the price of our salvation, and to be so defended by its power from the ills of this life on earth, that we may enjoy its everlasting fruit in heaven. Through the same. Lesson from the Epistle of blessed Paul the Apostle to the Hebrews. 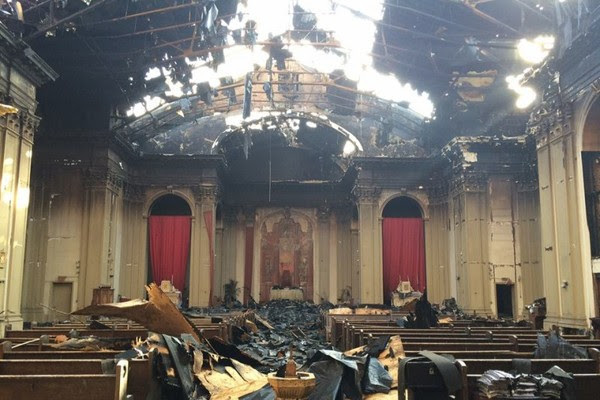 BRETHREN, Christ being come, a high priest of the good things to come, by a greater and more perfect tabernacle, not made with hands, that is, not of this creation, neither by the blood of goats or of calves, but by His own blood, entered once into the Holies, having obtained eternal redemption. For if the blood of goats and of oxen, and the ashes of an heifer being sprinkled sanctify such as are defiled, to the cleansing of the flesh, how much more shall the blood of Christ, Who, through the Holy Ghost, offered Himself without spot to God, cleanse our conscience from dead works, to serve the living God? And therefore He is the mediator of the New Testament: that by means of His death, for the redemption of those transgressions which were under the former testament; they that are called may receive the promise of eternal inheritance; in Christ Jesus our Lord. 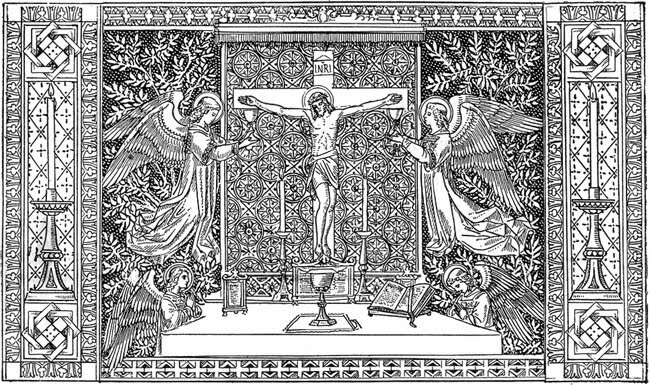 In Votive masses, from Septuagesima to Easter the Lesser Alleluia in the Gradual is replaced by the Tract. 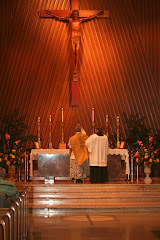 In Pascaltime the Gradual and Tract are replaced by the Greater Alleluia. This is He that came by water and blood, Jesus Christ: not by water only, but by water and Blood. V. There are three Who give testimony in heaven: the Father, the Word, and the Holy Ghost; and these three are one. And there are three that give testimony on earth: the Spirit, the water, and the blood; and these three are one. Alleluis, alleluia. V. 1 John, 5, 9. If we receive the testimony of men, the testimony of God is greater. Alleluia. Alleluia, alleluia. V. Apoc. 5, 9. Worthy art Thou, O Lord, to take the book, and to open the seals thereof: because Thou wast slain, and hast redeemed us to Gos in Thy blood. Alleluia. V. Exod. 12, 13. And the blood shall be to you for a sign: and I shall see the blood and pass over you; and the plague shall not be on you to destroy you. Alleluia. + Continuation of the holy Gospel according to St. John. AT THAT time, Jesus, when He had taken the vinegar, said: It is consummated. And bowing His head He gave up the ghost. Then the Jews (because it was the parasceve), that the bodies might not remain upon the cross on the sabbath-day (for that was a great sabbath-day), besought Pilate that their legs might be broken, and that they might be taken away. The soldiers, therefore, came: and they broke the legs of the first and of the other that was crucified with him. But after they were come to Jesus, when they saw that He was already dead, they did not break His legs. But one of the soldiers with a spear opened His side, and immediately there came out blood and water. And he that saw it hath given testimony, and his testimony is true. 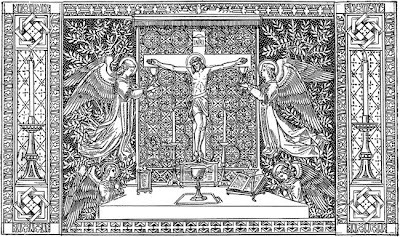 The chalice of benediction which we bless, is it not the communion of the blood of Christ? And the bread which we break, is it not the partaking of the body of the Lord? THROUGH these divine mysteries, we beseech Thee may we draw near to Jesus, the mediator of the New Testament, and renew upon Thine altars, O Lord of virtues, the sprinkling of the blood, which speaketh more eloquently than Abel. Through the same. Christ was offered once to exhaust the sins of many; the second time He shall appear without sin to them that expect Him, unto salvation. ADMITTED to the sacred table, O Lord, we have drawn water in gladness from the fountain of the Saviour; may His blood, we beseech Thee, become unto us a well of water springing up unto everlasting life. Who with Thee. 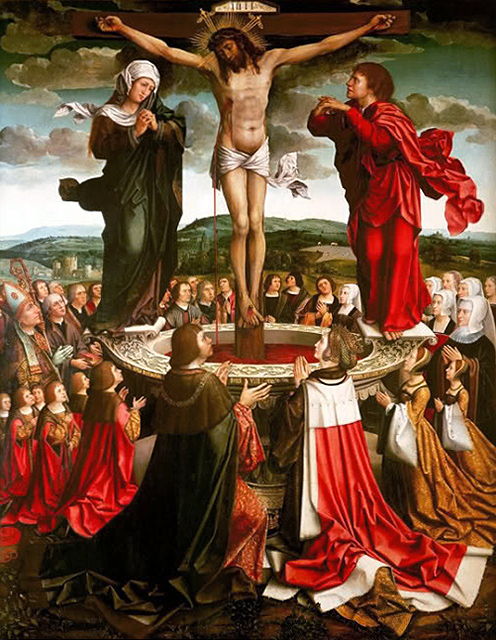 Eternal Father, I offer Thee the Most Precious Blood of Jesus Christ in atonement for my sins, and in supplication for the holy souls in purgatory and for the needs of holy Church. God, the Holy Ghost, have mercy on us. Blood of Christ, Incarnate Word of God, Save us. Blood of Christ, of the New and Eternal Testament, Save us. Blood of Christ, falling upon the earth in the Agony, Save us. Blood of Christ, shed profusely in the Scourging, Save us. Blood of Christ, flowing forth in the Crowning with Thorns, Save us. Blood of Christ, poured out on the Cross, Save us. Blood of Christ, price of our salvation, Save us. Blood of Christ, without which there is no forgiveness, Save us. Blood of Christ, Eucharistic drink and refreshment of souls, Save us. Blood of Christ, stream of mercy, Save us. Blood of Christ, victor over demons, Save us. Blood of Christ, courage of Martyrs, Save us. Blood of Christ, strength of Confessors, Save us. Blood of Christ, bringing forth Virgins, Save us. Blood of Christ, help of those in peril, Save us. Blood of Christ, solace in sorrow, Save us. Blood of Christ, hope of the penitent, Save us. Blood of Christ, consolation of the dying, Save us. Blood of Christ, peace and tenderness of hearts, Save us. Blood of Christ, pledge of eternal life, Save us. Blood of Christ, freeing souls from purgatory, Save us. Blood of Christ, most worthy of all glory and honor, Save us. 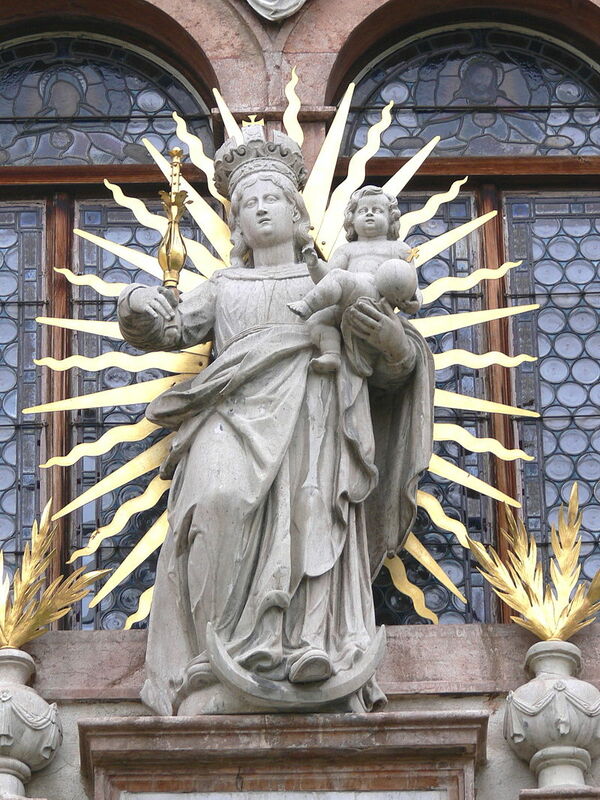 V. Thou hast redeemed us, O Lord, in Thy Blood. R. And made of us a kingdom for our God. Let us pray. Almighty and eternal God, Thou hast appointed Thine only-begotten Son the Redeemer of the world and willed to be appeased by His Blood. Grant, we beseech Thee, that we may worthily adore this price of our salvation and through its power be safeguarded from the evils of the present life so that we may rejoice in its fruits forever in heaven. Through the same Christ our Lord. Amen.